The cost of electrical energy varies with the source and a lot of other factors. There are many options, but only a few apply to homeowners and small business. The performance and costs vary with location and many other factors. 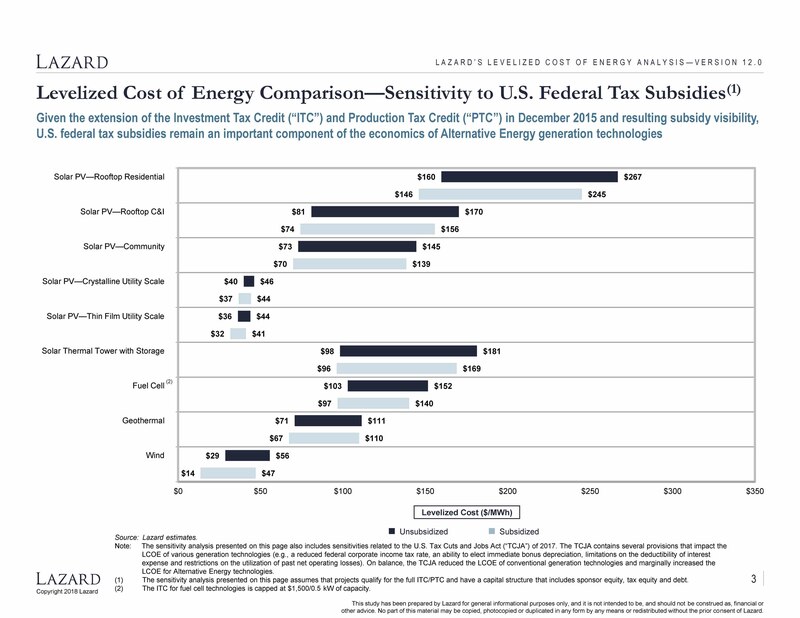 A recent report by Lazard, an international engineering firm, https://www.lazard.com/media/450773/lazards-levelized-cost-of-energy-version-120-vfinal.pdf, has some very interesting data on Levelized Cost of Energy (“LCOE”) for many sources of energy. LCOE is an accepted method for comparing costs. A good summary from the above report is shown below. Prices are in $/MWhr, divide by 10 for cents/kWh. The challenge is to relate this to Arizona and the differences that apply to apply to homeowners and small business. Arizona has high sunshine, but comparatively low wind resource. Rural land is lower cost than other areas. Therefore Solar PV in Arizona will generally be on the lower side of the indicated ranges.